GOP keeps claiming tax bill is aimed at middle class. It isn't. Republicans keep saying that the GOP tax bill is all about helping the middle class, not rich people. This malarkey will increase with the hurried House-Senate deal announced Wednesday that is all about getting a bill passed as soon as possible. The breakneck pace is reason enough to oppose the bill, with Republicans trying to finish before anyone knows what is happening. The quicker they act, the less opposition they face. Sens. Lisa Murkowski, Dan Sullivan and Rep. Don Young have yet to give a credible explanation to Alaskans about the long-term consequences of the bill. They haven't said how we're going to pay for a big hike in military spending or what cuts they want in Social Security, Medicare and Medicaid to pay for the deficits created by giving corporations and the wealthy a big tax cut. Anyone who opposes the bill is trying to "deny the Americans who need it, we need it, extra money in their pockets, particularly right now," Sen. Dan Sullivan said before the Senate vote. He's wrong. According to Sullivan, "the bulk of the relief we are providing in this tax bill is to provide middle-class families with more take-home pay, more money in the pockets of American citizens." "So, on average, right now, our bill would bring the average American middle-class family about a $200 additional amount of money in their pocket per month-per month. Now, some people watching that might think it may not seem like a lot, but it is over $2,000 per year." Actually the "bulk of the relief" is a $1 trillion cut in business taxes. That would be a permanent reduction, unlike the tax cuts for individuals. Those are set to expire in 2025, which means a tax increase lies ahead. The GOP attempt to create act-now-or-else hysteria reminds me of a desperate pitchman selling kitchen gadgets at the state fair. The one-page handout from the Trump administration, using imaginary numbers to show the tax cut pays for itself, reads like high school homework written during lunch. Here is a more credible analysis from the University of Pennsylvania's Penn Wharton School. It says the Senate plan would add more than $1.5 trillion to federal debt over the next decade. It is not smart politics to highlight what you are doing for rich people, so Republicans want to make it appear that families earning $75,000 are their real audience, not corporations and one-percenters. 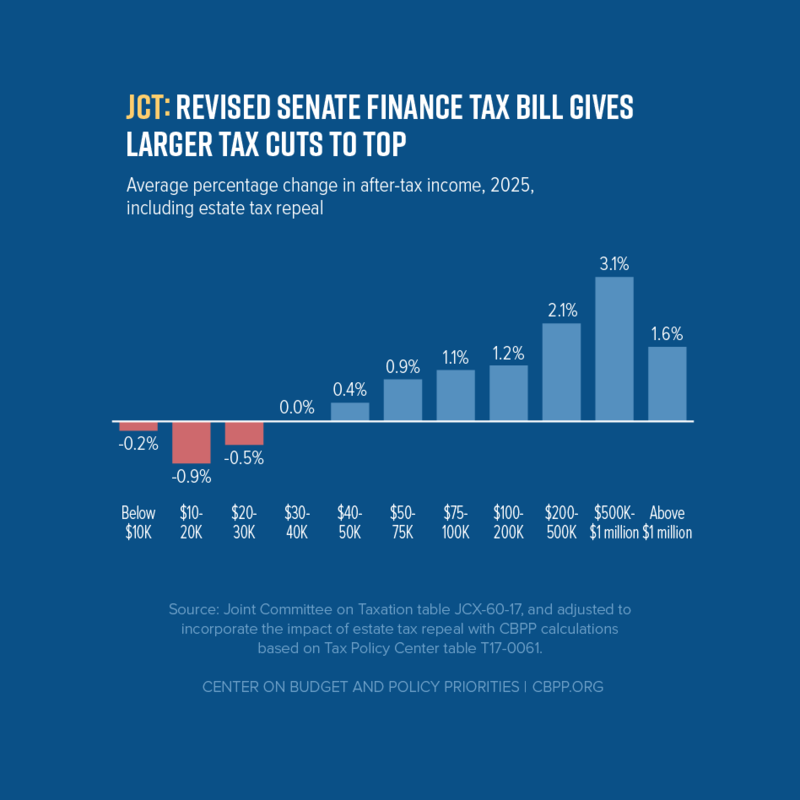 The Tax Policy Center of the Urban Institute and Brookings Institution say taxpayers earning between $50,000 and $87,000 would receive an average tax cut of about $800 in 2019 under the Senate bill. That's about $15 a week, which may not be enough to people to notice. "Taxpayers in the 95th to 99th income percentiles (those with income between about $310,000 and $750,000) would benefit the most as a share of after-tax income, with an average tax cut of about $10,000 or 3.1 percent of after-tax income. Taxpayers in the top 1 percent of the income distribution (those with income more than $750,000) would receive an average cut of $28,000, or 1.8 percent of after-tax income." Write to me at dermotmcole@gmail.com with comments.